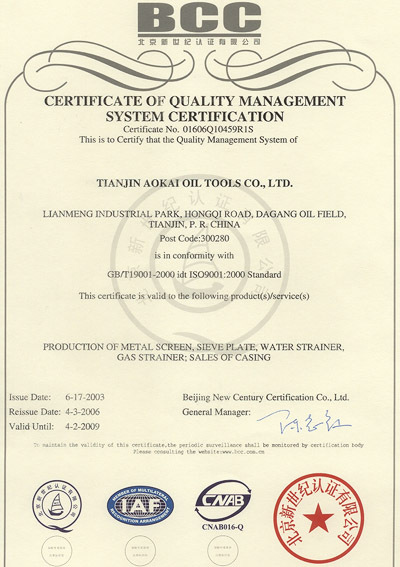 Company Overview - Tianjin Aokai Oil Tools Co., Ltd.
13YRSTianjin Aokai Oil Tools Co., Ltd.
Tianjin AoKai Oil Tools Co. Ltd. is located in Dagang oilfield, Tianjin city with convenient transportation. We can supply well screen pipes, petroleum pipes, sand control screens, sieve plates, water and gas strainers, nozzles, drill tools, casing, tubing and collars with professional technology. Since the company establishment, we insist on quality the first. According to professional standards and ISO9001, we have set up the efficient management and strict quality control system. We can guarantee the quality of all the products. Our products are exported to the USA, Sudan, Bangladesh and Philippines and have won a high reputation. Our company owns the advanced equipments and strict inspection processes and in a position to provide the high-quality services for customers. We sincerely hope to cooperate with customers from all over the world. Please contact us for more details. Issued by Beijing New Century Certification Co., Ltd.
Production of metal screens, sieve plates, water strainers, and sales of casing.